On NPR this week, Kathy Gunst spoke about transitional recipes to help us segue into spring. These are recipes that use the last of winter produce with a hint of what’s to come when our gardens recover. The same though has crossed my mind. Don’t we automatically look for fresher flavors when the days become longer and brighter? 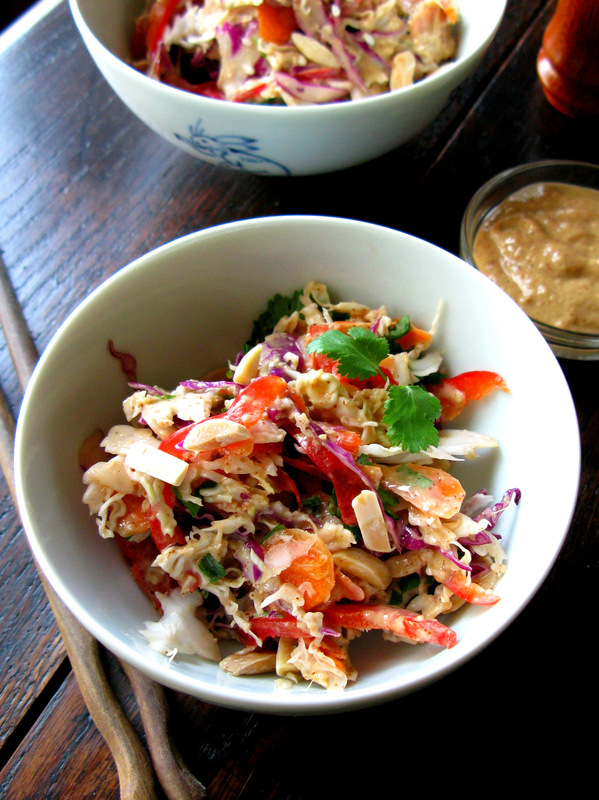 This Asian inspired coleslaw incorporates some of my favorite flavors, fresh ginger and creamy almond butter among them. It is bright and refreshing. The satisfying crunch of the shredded cabbage and peppers builds on the flavor experience. It may become your go-to summer salad. The dressing, made with a generous dollop of almond butter, works just as well as a marinade for grilled chicken or a sauce for a lamb burger or cold noodles. Don’t the bright colors say spring? You can use a good sharp knife to shred the cabbage or a mandolin. My secret is a flat, hand-held slicer that we bought at Williams Sonoma. It does one thing very well. 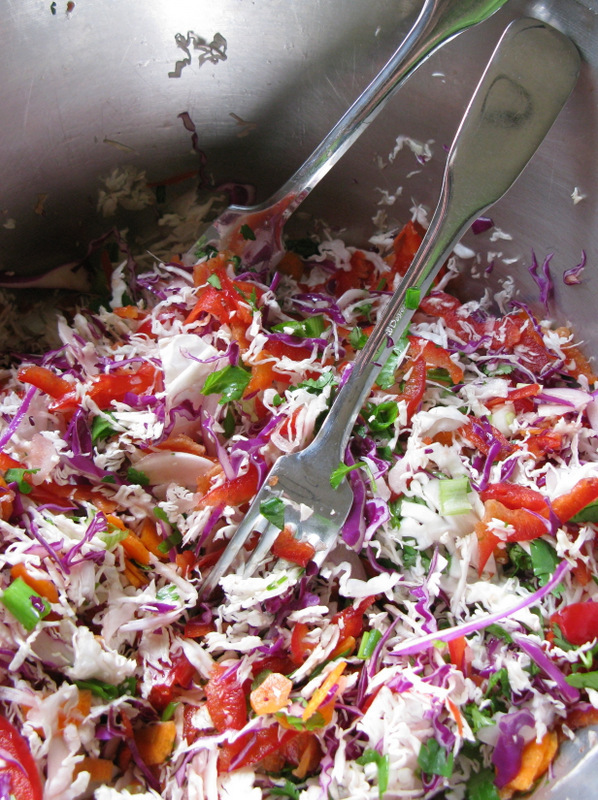 And if you don’t have the time or the knife skills to shred the veggies, purchase precut bagged coleslaw blend. In our house almonds are a pantry staple. I like dark-roasted almond butter for this recipe because it imparts a pronounced nutty flavor. (American Almond Products Company supplies me with its nut butter, which is sold to bakers and confectioners.) When you go to purchase almond butter in a local store, look for a rich dark color and little oil separation. (Nut butters that sit on the shelf for a while tend to separate.) Although I have made the dressing in a blender, I prefer to use an immersion blender. It is easy to set up in any deep beaker. The immersion blender emulsifies and aerates small or large quantities with ease. To some the dressing may be rather tart. Add a little honey, agave syrup or brown sugar if you need to sweeten it a bit. Dress the salad right before serving to keep the coleslaw from wilting. Add about half of the dressing then toss the salad. Taste and see if you need more. Save any leftover dressing for a bowl of udon or chewy rice noodles. A few years back an Asian friend told me a trick her mother taught her. 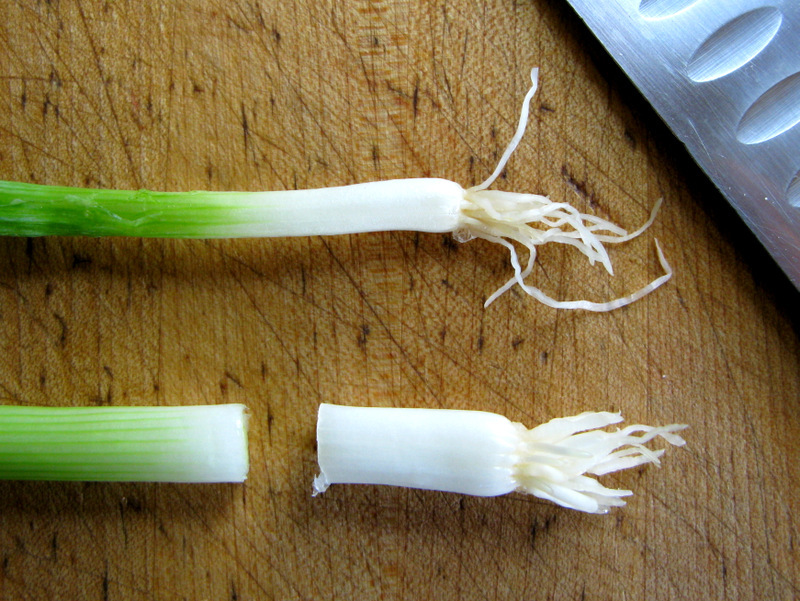 You can get a second crop from a bunch of grocery store scallions if you plant the root ends. Leave the root end on the scallion with about 3/4-inch of the white part attached. Plant the root 1/2-inch deep in light garden soil. Mark the scallion plot with sticks or plastic spoons because they will be difficult to see. Water and watch them grow. I always get a second crop from at least 80% of what I plant. Combine the rice vinegar, oil, almond butter, soy sauce, lime juice, ginger and garlic in the bowl of a blender. Cover and blend on high power until creamy, smooth and frothy, for about 2 minutes. Or place in a tall beaker and blend with an immersion blender. 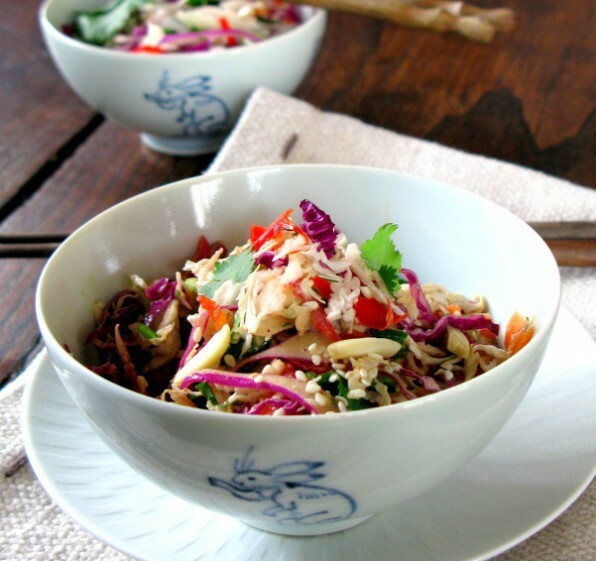 Combine the green cabbage, red cabbage, red bell pepper, carrots, scallions and cilantro in a large bowl. Toss with the dressing just before serving using only as much dressing as suits your taste. Sprinkle each serving of the coleslaw with sesame seeds and toasted slivered almonds. If this dressing is to tart for your taste, go ahead and add a little honey, agave syrup or brown sugar to sweeten it a bit. A teaspoon may be all that's needed to mellow out the acidic flavors.